I am not one of those people who refuses to turn on the oven in the summer. I think there are perfectly good reasons to do so and new potatoes are one of them. Sure, roasted potatoes are tempting any time of year, but the tiniest new potatoes you see in the spring and summer are special. Their very size makes them ideal for roasting because they don’t need to be cut to cook evenly. Maybe one or two need to be halved, but if you can get the really teensy ones, do so for this recipe. Their skins will blister and crisp up, and the insides will get cooked to creaminess in just twenty minutes. They almost burst in your mouth. And these potatoes are even better, because, butter. Usually i roast potatoes with olive oil and herbs–you too I’ll bet. I could have used olive oil here, but I used the “specialness” of these new potatoes as an excuse to use butter. And a lot of garlic, which cooks in the nutty-flavoured fat of the butter in the high heat of the oven. Each time I make these, after the potatoes are all gone, I swipe my finger through the butter/herb/garlic sauce left behind on the foil and lick away. You can use a spatula or something more dignified–just make sure those remnants make it into someone’s mouth. Meanwhile, set aside the sprigs of thyme and dill for garnishing, and roughly chop the leaves. Mince the garlic. 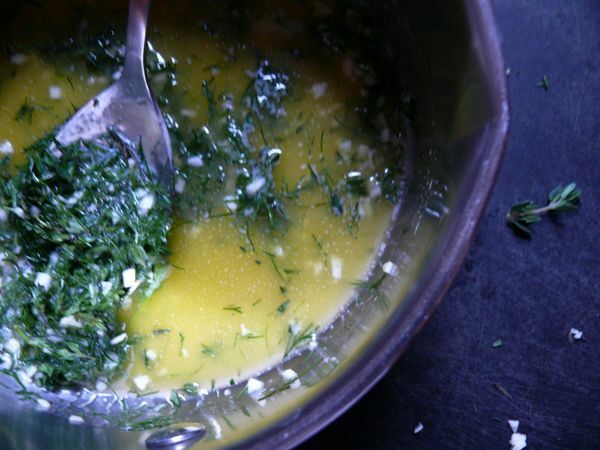 Set a small pan over medium heat and add the butter, chopped herbs, garlic and coarse salt. Heat the butter until it’s half melted. Remove the pan from heat and continue to stir. The residual heat will melt the butter. 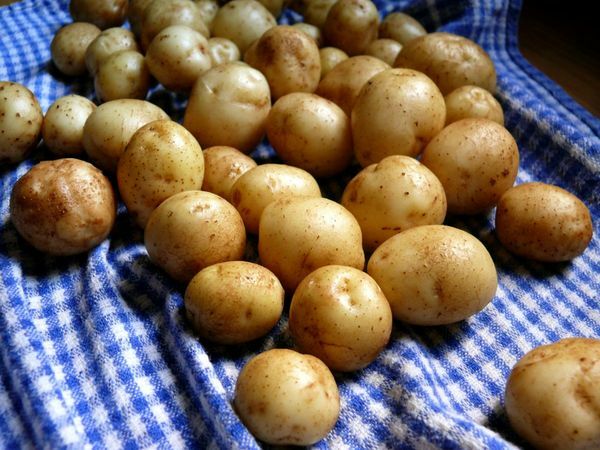 Leave the tiny potatoes (one inch in size) whole, and cut any potatoes larger than that in half. add all to a large bowl. Pour the seasoned, melted butter over top and mix well to coat the potatoes. Line a large, 4-sided baking sheet with foil, and pour potatoes and the mixture out onto it evenly. Bake on the middle rack of the preheated oven for 20 minutes. The butter will start to bubble and brown. 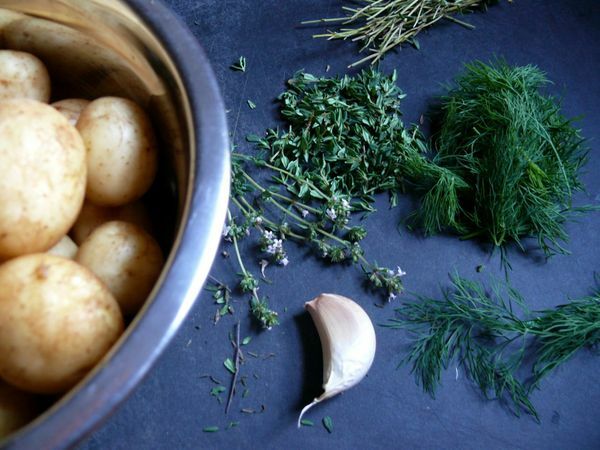 Check any larger pieces of potato with a fork and make sure they are cooked through. If not, roast for another 5 minutes. 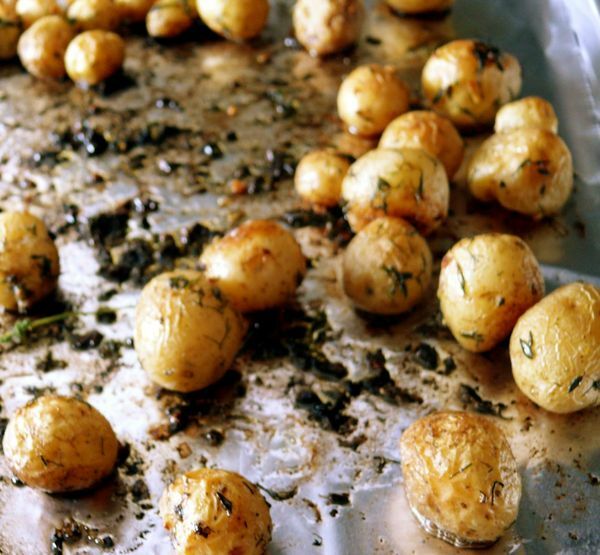 Remove the sheet from the oven carefully and mix the potatoes well in the butter and herbs. Crush some of the maldon salt in your fingers and sprinkle it over top of the potatoes. Strip the leaves from the herb sprigs set aside and scatter them over top. Serve hot. I don’t like using my stovetop in the summer (because my house is not air-conditioned and on really humid days, it can actually feel hotter inside than outside), but oven, I’m all game. Roasted potatoes with butter. The combination sounds too good. thats true. i always think of the oven as too hot, but the stove top can let off a lot of heat too. thanks, maria, im glad you like blog and especially that the recipe inspired part of your dinner. hope its a success!